In this brand-new collection of short stories, Aidan Chambers explores moments of truth, when a character or an event suddenly reveals an often-surprising meaning: A girl loses her humanity when she takes a summer job as a theme-park character; a boy tries to save a girl from a fiery death, only to discover the same event happened one hundred years before. And the titular story, in which an innocent game takes a fatal turn, will haunt the reader for a long time. These provocative stories beautifully lend themselves to discussion, and once again Chambers treats us to his fiercely intelligent, finely crafted prose and his incisive understanding of the wonderings of young people on the verge of adulthood. I thought this was a fab little quick read. 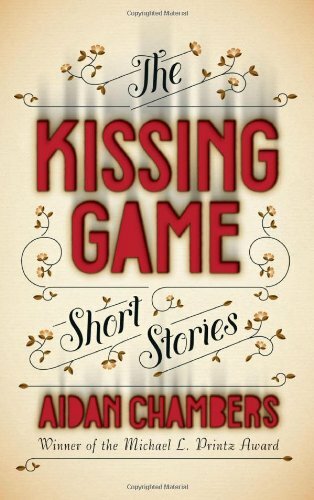 The Kissing Game is a collection of short stories all based on the different experiences of teenagers. I liked how diverse the stories were. There were a few longer ones, some done as scripts, others as letters / monologues. I really liked the variety as you were never sure what you were getting next. Out of all the stories there were a few that really stood out for me. One story was a letter written by a boy who lives outside the system in a house he built in the woods to the council who are trying to get his house pulled down. I loved the idea behind it and the morals the story put out there which were put together well in a very short piece. I loved the letter from one boy to his teacher about why he was not participating in PE. I thought it was brilliantly funny. A couple of the stories were quite dark. The title story the Kissing Game is quite dark in its content but almost quite sweet. There is also a story about a young girl who is an illegal immigrant and being used for all kinds of awful things by the man who helped her get into the country. All in all a fab collection of stories which were intelligently written showing a real insight into teenagers today. Bad Kirsty! Now I will have to read this. This one does sound like a lot of fun, something quick and easy to get through but also interesting!